Last last nite, I had a dream...It was a beautiful dream...It makes my heart goes softie just thinking about it...The sad thing is, I woke up when it just starts getting better. My most important question left unanswered. Last nite, I hoped so much for the dream to continue, but it didn't. It was dificult to keep my eyes closed, coz I try setting my mind on that dream, coz when you think of sthing real hard, it will appear on your dream, so people says. But it didn't happen. I must be mad. I think it happens to all people. 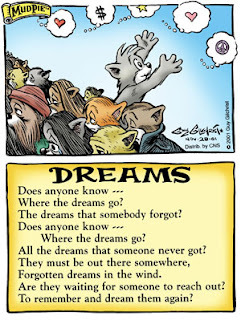 But, dreams are just dreams. Keep your feet planted on the ground. It's time to do the reality check. Urgghhh..I hate real world!